While this shows how to renew the seals on Metro calipers, the process is the same for any of the 2 or 4 pot Mini calipers. Click on the pics for larger 1024w images. Disclaimer : It is quite easy to install the seal kit in the calipers, but if you're not confident enough, take it to a professional brake shop. it is YOUR responsbility to ensure that the work is done properly. I was quoted around $100 to do it. 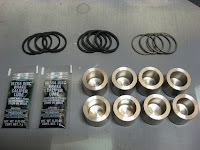 This is a cross-section of the three parts included in a kit. 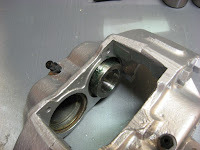 Note the "V" groove in the wiper seal as opposed to the square cross-section of the main seal. It's normally a pretty easy job by inserting air compressor nozzle in the brake line inlet and carefully applying some air. One or more pistons will pop out. BE CAREFUL of this because they can release at a high velocity so don't leave your fingers in there! When each piston pops out, insert it back into the bore a small amount (so it can be removed by hand later) and clamp it in place with a G-clamp, so when you apply more air then the opposite piston will pop out. I had issues with 2 pistons which refused to budge by giving it a blast of air (As it turned our later, rust had got under the hardchrome of the pistons and wouldn't let the piston move past the seals). Applying a higher air pressure didn't work so I used my grease gun instead. 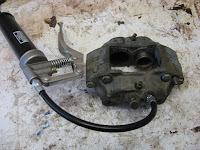 It had the same thread as the main brake line inlet on the calipers so I screwed it in and pumped away. Slowly but surely the pistons were forced out and I cleaned the grease out of the calipers by soaking them in petrol for a a few hours or so to break down the grease and blew it all out of the lines with the air gun. Most of the old pistons were badly pitted and so were thrown out. 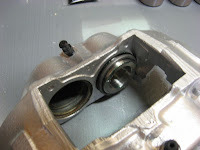 Re-installing pistons such as these is a BAD idea as it will ruin the new seals in no time and will start leaking. 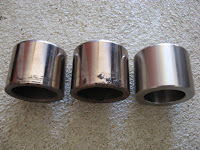 The left piston had some marks on the surface, the middle piston had the hard chrome lifting from the surface. The right piston is the new stainless steel one which will never have the issue of the brake fluid getting under the hard chrome surface. If the bores are dirty of have deposits of old brake fluid & general crud in them, get some 600grit sandpaper and wet sand the bores until clean. 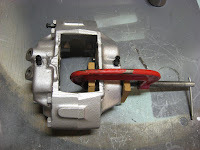 If you want to repaint the calipers, do it at this point. Loosen or remove the bleed screws in the calipers. If you don't, then you find it very hard to push the pistons in later as there is nowhere for the air in the calipers to escape. Clean out the bores with some brake fluid or methylated spirits and dry off with a lint free rag to remove. 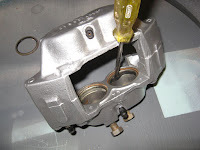 Coat a new fluid seal with brake lube (seal must be dry before applying) and ease the seal into the groove in the piston bore. The seal will sit slightly proud of the bore. 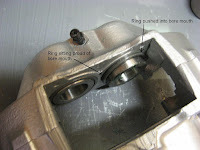 Provide a liberal coating of brake lube on a piston and insert the piston into the bore until about 8-10mm of the piston is still protruding. 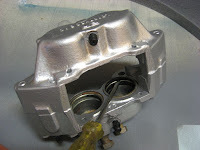 The piston MUST be square and not tilted when inserting it. 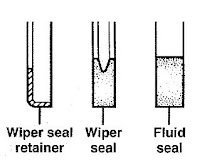 Coat a wiper seal (has the "V" groove inside the seal) in brake lube (seal must be dry before applying) and fit into a metal retainer. 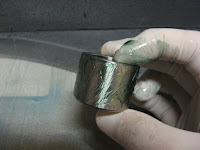 This can be tricky to do when you hands are covered in grease Slide the seal and ring (seal facing inward) over the piston and push up against the bore mouth. The retaining ring is a press fit into the top of the piston bore. I found it useful to push (by hand) the outside part of the ring into the bore mouth first and then use a G-clamp to clamp the piston down and press the other part of the retaining ring in place in one. You may find you will hear a small click when the retaining ring seats into place. Do NOT be tempted to get anything like a punch to try and force the ring into place - they damage easily. 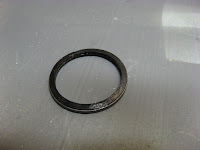 If the ring does not seat properly, use a G-Clamp (and some bits of wood) on the parts of the ring that are sitting too high. Once complete, repeat for the other pistons/seals. I made a tool up from nylon bar, bored 8mm deep to the piston diameter. I put this over the piston and press the seal retainer fully home in the vice. No chance of retainer damage then. Nice one Mearcat - very handy write up! Like Audrey Hepburn, almost everybody loves the Mini. The only people who didn't love the Mini were pathetic, empty people.